Pick your own Farms in the U.S, Canada, Britain and other countries - Find a farm near you! Find a pick your own farm near you! This website provides local listings of pick your own (also called U-pick or PYO) farms in the United States, Canada, Britain, Australia, New Zealand, South Africa and other countries. There are crop calendars for each local area to tell you what is available to pick throughout the year, local weather forecasts and really easy illustrated directions to show you how to make jam, jelly, salsa, pickles, spaghetti sauce, applesauce, apple butter and 150 other recipes with step-by-step directions to can, freeze, dry or preserve the harvest. 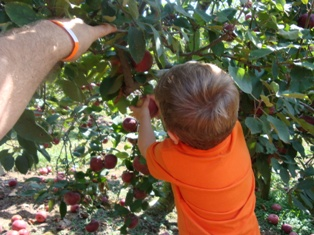 Whether you call it pick-your-own, PYO or U-pick, it's easy to find one near you! There is a "Start here" button (at the top of the left of every page). You then select your local area (country, state/province) and then region/county or local metropolitan area. Just scroll down the page that appears, to see tree farms, lots or events listed by county. The search engine can be helpful, too. You can also find a related fruit or vegetable festival (like a tomato festival, corn fest, blueberry festival, strawberry festival, an applefest or more) or even an Easter Egg hunt at farms and churches! If you are looking to save money in other ways, see ConsignmentSaleFinder.org to find a children's consignment sale near you. And finally, St. Patrick's Day is this week - find great Irish recipes, parades, history and folklore here. Click on your state or country below to find pick-your-own farms in your area! [Austria ] [ Australia ] [Belgium ] [Canada ] [Denmark] [France] [Germany ] [Ireland] [Italy] [Japan] [Malta] [Nederland / Holland / the Netherlands] [ South Africa ] [ New Zealand ] [Norway] [Philippines ] [Sweden] [Switzerland ] [ United Kingdom ] [ Adding a Farm outside of North America ] Looking for pick your own farms in other countries? Living in another country, such as France, Italy (Italia), Germany (Deutschland), Nederlands, or Sweden? Help me compile a list for your country - just write me!